Last week, we learned about how repetitive action can cause muscular and bone stress. The experts at Center for Spine and Ortho would like to remind our patients that recovery after exercise is key to avoiding injuries and should be an essential part of the workout routine. Read below for 10 steps to speed recovery after exercise. Rest and recovery is an essential part of any workout routine. 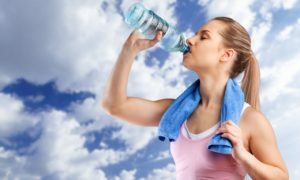 Your after-exercise recovery routine has a big impact on your fitness gains and sports performance and allows you to train much more effectively. Unfortunately, most people don’t have an after exercise recovery plan. Here are some tips to get your post-workout plans on track. Recovery after exercise is essential to muscle and tissue repair and strength building. This is even more critical after a heavy weight training session. A muscle needs anywhere from 24 to 48 hours to repair and rebuild, and working it again too soon simply leads to tissue breakdown instead of building. For weight training routines, never work the same muscle groups two days in a row. After depleting your energy stores with exercise, you need to refuel if you expect your body to recover, repair tissues, get stronger and be ready for the next challenge. This is even more important if you are performing endurance exercise day after day or trying to build muscle. Ideally, you should try to eat within 60 minutes of the end of your workout and make sure you include some high-quality protein and complex carbohydrate. Time is one of the best ways to recover (or heal) from just about any illness or injury and this also works after a hard workout. Your body has an amazing capacity to take care of itself if you allow it some time. Resting and waiting after a hard workout allows the repair and recovery process to happen at a natural pace. It’s not the only thing you can or should do to promote recovery, but sometimes doing nothing is the easiest thing to do. Some athletes swear by ice baths, ice massage or contrast water therapy (alternating hot and cold showers) to recover faster, reduce muscle soreness and prevent injury. The theory behind this method is that by repeatedly constricting and dilating blood vessels helps remove (or flush out) waste products in the tissues. Limited research has found some benefits of contrast water therapy at reducing delayed onset muscle soreness (DOMS). Adding a mental practice to your workout routine can be a huge benefit for any athlete. Spending time practicing mental rehearsal or following a mindfulness meditation program can help process a calm, clear attitude and reduce anxiety and reactivity. Getting familiar with how your mind works, how thoughts can bounce around, and how you don’t need to attach to any of them, is a wonderful way for an athlete to recover both mentally and physically. Additionally, practicing positive self-talk can help change the ongoing dialogue in your head. Consider using both types of mental practice during your recovery days. The most important thing you can do to recovery quickly is to listen to your body. If you are feeling tired, sore or notice decreased performance you may need more recovery time or a break from training altogether. If you are feeling strong the day after a hard workout, you don’t have to force yourself to go slow. If you pay attention, in most cases, your body will let you know what it needs, when it needs it. The problem for many of us is that we don’t listen to those warnings or we dismiss them with our own self-talk (“I can’t be tired, I didn’t run my best yesterday” or “No one else needs two rest days after that workout; they’ll think I’m a wimp if I go slow today.”). Original article published on Verywellfit.